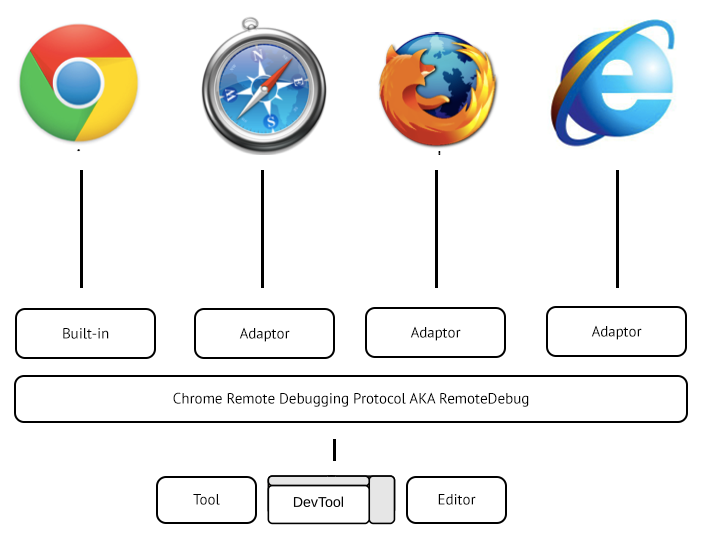 RemoteDebug is an initiative to bring a common remote debugging protocol to today's browsers. The vision is to enable a new generation of DevTools and editors that are able to communicate independently of their vendor. Update July 2017: Read about Introducing RemoteDebug Compatibility Tables for remote debugging protocols and APIs Update: Read about RemoteDebug and cross-browser DevTools. One year later. Today each browser vendor is building their own tailormade in-browser development tool (DevTool), together with their own protocol to enable remote debugging of browsers across devices. These protocols are incompatible with each other, which means existing DevTools can't debug other browsers, and tooling implementers needs to put a lot of effort into adding support for each protocol, with the result that we haven't seen that many integrations. The open web follows standards. Our tools should too. The vision is to enable a new generation of DevTools and editors that are able to communicate with our several browsers independently of their vendor. The RemoteDebug initative was announced at FullFrontal 2013 by Kenneth Auchenberg in his "Our web development workflow is completely broken" talk. Browser history shows us that the dominant browser will change. Why do we keep making browser specific tools, when we know it's going to change? What if it was possible to use Chrome DevTools to debug Firefox, or use Firefox DevTools to debug Chrome? What if you could debug your app in IE and Chrome directly from Sublime Text? What if the browser had an API, you could use to extract and manipulate information to build better development tools, instead of re-creating the logic we already have? What if you could use your favorite debugging tool to debug your beautiful PhoneGap-app inside an embeded WebView? What if the browser DevTools-teams worked and innovated together instead of the current situtation?